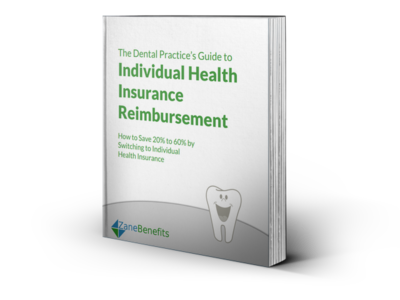 Zane Benefits, the leader in individual health insurance reimbursement for small businesses, announced today the publication of a new eBook, "The Dental Practice's Guide to Individual Health Insurance Reimbursement." The guide helps dental practices switch to individual health insurance reimbursement and offer excellent health benefits at a controllable cost. According to Zane Benefits, 100 million Americans will move from employer health insurance to individually-purchased health insurance over the next 10 years. Individual health insurance is now equal to, and in most cases better than, group health insurance. And, it costs less. Individual health insurance costs about half the price (pre-subsidy) and about one-quarter the price (post-subsidy) than group health insurance. For dental practices, rising healthcare costs make it more expensive to add new employees and puts a strain on their core business - serving patients. With a reimbursement program, dental practices have a flexible, affordable health benefits program that helps recruit and retain the best dental staff. This eBook is a guide for dental practices to offer health benefits to their valued employees.